In the many months that followed the San Antonio Spurs’ crushing collapse in the 2013 NBA Finals, Gregg Popovich was always open about one thing: The Miami Heat still were haunting him. But the Spurs coach may have a new figure to fixate on after the Oklahoma City Thunder’s 106-97 Game 3 win in the Western Conference finals that cut San Antonio’s series lead to 2-1: Serge Ibaka. The Thunder big man made his miraculous recovery from a left calf strain on Sunday night at Chesapeake Energy Arena, impacting the game in all the crucial ways he had when the Thunder won 10 of their last 12 games against the Spurs entering this series. He treated the paint like it was his own personal man-cave, blocking four shots and grabbing seven rebounds in all while contesting and altering countless others. He gave the Thunder the third scorer they were so sorely lacking, scoring 15 points in 30 minutes while hitting six of seven from the field. All this after the now-infamous press release from the Thunder back on May 16 in which the doomsday message became official. “Ibaka is expected to miss the remainder of the 2014 postseason,” general manager Sam Presti said in the news release after Ibaka suffered his injury in Game 6 of the previous series against the Los Angeles Clippers. As the first two games had so clearly shown, Ibaka’s mere presence on the floor allows the Thunder to compete as Presti always intended. Kevin Durant doesn’t have to do things like guard Tim Duncan (see Game 1), and role players like Nick Collison aren’t forced into unfair situations in which their typically valuable talents are no longer a factor because of the ripple effect of Ibaka’s absence. So it was in Game 3, as the Spurs— who shot a combined 53.8% from the floor in the first two games while scoring 122 and 112 points, respectively — hit just 36 of 91 shots (39.6%%) and suddenly struggled to run the offense that had been so unstoppable. In the ever-important points-in-the-paint category that has said everything about the Ibaka effect, the Spurs had just 40 in Game 3 after averaging 60 in the first two games. Thunder coach Scott Brooks made the tough decisions here that went past Ibaka, too, benching Collison and shooting guard Thabo Sefolosha (neither played) while putting point guard Reggie Jackson (15 points on six of 13 shooting) in the starting lineup with fellow point guard Russell Westbrook, center Kendrick Perkins, Ibaka and Durant. Durant finished with 25 points (8-for-19 shooting) and 10 rebounds while Westbrook had 26 points (8-for-19 shooting), eight rebounds and seven assists. The Thunder didn’t pull away until the fourth quarter, when they led 104-84 with 4 minutes remaining before the Spurs closed on a meaningless 13-2 run. Ibaka was pulled with 3:16 left and the 20-point lead still in tact. Ibaka wasted no time in making an impact. On the Spurs’ first possession, he closed and contested on a Parker midrange jumper that misfired and followed with a jumper of his own to start off the scoring. He hit all four of his shots in the first quarter for eight points and had three rebounds and two blocks as the Spurs led 29-28. By comparison, his replacement, Collison, had totaled two points, five rebounds and one block in the first two games. But Manu Ginobili almost single-handedly kept the Spurs close, hitting seven of 10 shots (including five three-pointers) in the first half for 20 of his 23 points. Still, the drastically changed landscape was already evident. 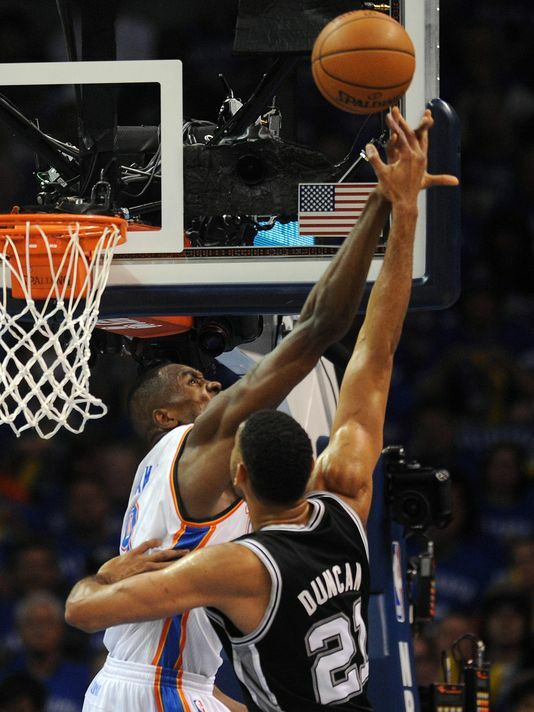 You are currently reading Serge Ibaka returns, lifts Thunder past Spurs in Game 3 at ARE YOU NEXT.